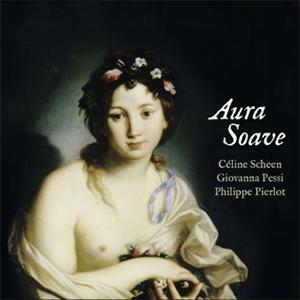 This second recital from Céline Scheen for Flora label takes us to the sources of baroque, these " Nuove Musiche " and this new practice that will change the course of Western music. Italian monody from the early 17th century has a variety of forms: the popular accents and naive ditty " Augellin " meet the " falalas " of Gastoldi's impulsive dance tunes, or the subtlety of the madrigal "Aura Soave". The "Amarilli" is unrecognizable here, disguised by a myriad of ornaments and supported by a single bass viol played in the manner of the lyre. Support is given primarily to the harp, considered by Italian at the time as "the Queen of instruments", but also uses the "concerto di viole" that provides particularly intensive support for the most poignant pieces like "Torna" from Caccini or the beautiful allegory from Arazzoli, "Sopra la Rosa".